By definition, salves promote healing and protect your skin. Here we take this to the next level by adding lemon oil, which is known to have a detoxifying and revitalizing effect and to brighten dull skin. We do this by blending our aromatic KATZ Organic Meyer Lemon Olive Oil with pure essential oils and rich beeswax to create a penetrating salve to moisturize and restore overworked hands, aching joints, and sore muscles. A number of our restaurant chefs tell us that after a long day in the kitchen it is a relief to use our salve to give much needed moisturizing to their tired hands and wrists. 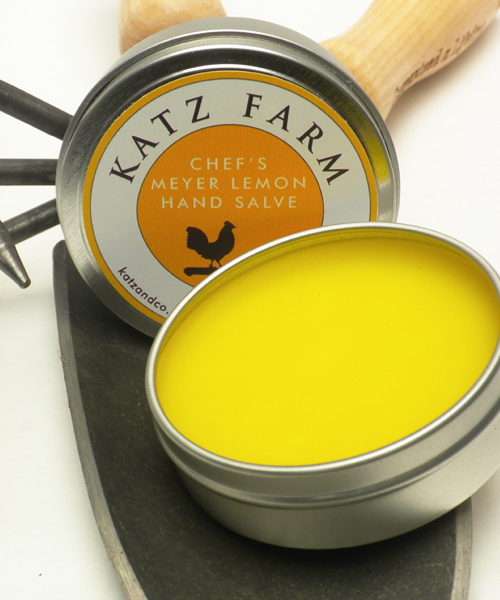 So for home chefs and gardeners it will feel great to treat your working hands with KATZ Meyer Lemon Salve…a well-deserved treat. List of ingredients: KATZ Meyer Lemon Oil, avocado oil, jojoba, beeswax, vitamin E, essential oils of litsea, lavender, calendula, rosemary and geranium.